This whole thing is finally starting to get the better of me. I’m sure it’s just this particular week, and just the wrong combination of circumstances – for all I know I’ll be giggling about everything like a child by the end of the night – but I’m really just feeling incredibly drained. I’m just not engaging with everything like I usually do – something just isn’t clicking! I’m barely keeping up with my editing schedule (though I am keeping up!) and find myself coming home from eight hours of work (a slow, slow week with little money) to find Vosh waiting in my room to look at the cut, and then launch straight into a long night’s work only to get a few hours sleep and then repeat the cycle. So sick of working multiple service jobs every day of every week to get enough money together to do this thing. I don't even want to get started about what hasn't been getting done on this doc that should be finished by now, and the heroic amount of effort it takes to get people together and keep things on track. I’m not really the complaining type, but I figured I may as well try not to be one sided about the awesomeness of doing a major project like this. If it was easy, I’m sure many more people would be doing it, but it seems like the more you want out of life, the more you have to work tirelessly at it. It will all be worth it when I’m standing in Rivendell or Mirkwood with legions of fellow elves. On the bright side, things should hopefully be turning around for the better today. I made it back to the gym again after a couple unintentional days off (wrapped up in editing) which was amazing, plus me and Dan are about to embark on our first experience together of being extras. In a couple hours we will be on the set of Degrassi playing “university students”. Might be tough to get into character. Plus our friend shoots the behind the scenes on that show, so we should get all kinds of awesome footage. Dan’s very specific criticisms of Adventurer are really helping me to rethink things and bring the doc to a better level, while Clare’s recent comments after seeing it for the first time are rather motivating. It’s nice to see that even in its present state it is something that is very entertaining/interesting to someone who's entirely unfamiliar with it. Anyway, enough whinging (I’m starting to sound like Karl Pilkington), time to get out and make things happen! 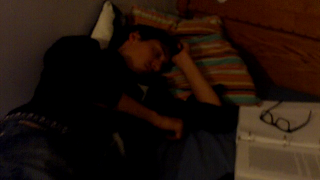 Vosh passed out on my bed after a long night's critique of the latest edit. If only that could be me! CC: Past the Point of No Return?